This narrative non-fiction account of Maisie, daughter of Reinhold (Jack) Schuster of Broken Hill, continues the heartbreaking story of Silver Lies-Golden Truths, the death of Jack on 14 August 1940 and the devastating impact this had on his daughter. Growing up during World War II without her beloved father was tough, especially if you lived on the wrong side of the mines that divided the city. If you were a girl, headstrong and German, you needed plenty of spirit. Set against the social and economic problems of the time, particularly its very high rate of unemployment, it again debunks the myth that it was the birthplace of solidarity by exposing still more divisiveness, prejudice and powerlessness. The story also highlights the bullying at school and in the town, loneliness and isolation, the beer strike and Temperance movements, Botanist Albert Morris, war regulations, discrimination and maltreatment, diphtheria, ‘miners titis’, JP Martin’s store, petrol and tobacco rationing and rations, the powerful Housewives’ Association, Unions and Lodges, dust storms and an overbearing mother. They are all part and parcel of Maisie’s story. Ellis’ book is not a literary biography of Maisie, neither is it an academic and all-encompassing record of Broken Hill. It gives slices of the Silver City’s colourful story, the parts that impacted on Jack, Maisie and the family. Although some of the stories defy belief, there has been no need for tinkering. It is the true story of the indomitable Maisie who struggled to escape the town, a controlling mother and later, an alcoholic husband. Her father died when she was just nine, but his memory and voice remained her compass for the rest of her life. When Maisie stood at the foot of his grave she wondered why he was buried with his first wife and his first child. It was all beyond her. His second wife, Rose had been so possessive of Jack. And why were there policemen who had previously raided and ransacked the Schuster’s house only one week into the war and confiscated postcards, letters, photographs, the radio and the family Bible? Maisie very soon decided her life without Jack would no longer include school, where she always had done well and decided to become a nurse. Meanwhile her Australian mother had to register as an enemy alien, on account of being married to a German, and immediately started the long frustrating and demeaning process to become a naturalised Australian. It was more than she could handle. Maisie was to suffer the brunt of her frustrations and ill-temper which often resulted in screaming, hitting and kicking by both of them. When Darwin was bombed on 19 February 1942, killing 243 people, Broken Hill residents were not impressed with regulations enforcing the black-out of outdoor entertainment and sporting facilities at night. Construction began on air-raid shelters at the schools, hospital and mines which was all very frightening to the younger people. Maisie who was claustrophobic lived in a perpetual state of fear. At 12 Maisie was a well-developed girl both physically and in strategic combat with her mother. She even looked forward to high school and her Rechabite meetings which had played a huge part in her life. However the weekly highlight was the Saturday movies although it was not until 1947 that she was able to see Gone with the Wind. Maisie’s attractive figure, and Rose’s determination to hide it, caused many battles between them and even more so when she dared to ask for a bra. To solve the problem she made one herself. After turning 14, Rose kept her at home to help out with the housework. Yet listening to the Dad and Dave from Snake Gully serials on the radio did bring the two a little closer. Even so Maisie was determined to find a job. Being successful almost immediately she was soon well-liked, earned good money and within a short time opened her own business. Rose tried to control Maisie by keeping her at home as much and often as possible. However by the time she was 16 she had become a registered hairdresser and beauty operator managing a busy salon and teaching a 15 year old apprentice. All to no avail. After another violent argument with her mother Maisie caught the train to Adelaide with the resolve not to come back. She did come back, eventually, but after more domestic trouble left again. This time it was Sydney. Here she met Arnold Cameron, a returned digger, who had enlisted when only 17 years old. Serving in Papua as a stretcher bearer he had suffered malaria, dysentery and hay fever. He was six years older than Maisie and his service record showed him being disorderly, often drunk and absent without leave. On their first date he turned up late and drunk. There were always excuses but never his fault. He was sacked from his job after being late and drunk after lunch break. Maisie tried to leave him several times but Arnold was a good and smooth talker. In the end she decided to return to Broken Hill ….. with him. Rose was pleased but also convinced that it wouldn’t last – and it didn’t. After Arnold left Maisie she found herself an excellent job but all Rose could do was complaining that she worked in a shop in which none of her family could afford to buy anything. Somehow Maisie still cared for Arnold and left work and family again to meet up with him. After repeated promises to change they were married in Brisbane in 1952. Soon drink spoiled everything again and beatings became common even while carrying his child which was born in 1953. A year later when the Queen visited Broken Hill, Maisie and her daughter were there too. She had left Arnold after sustaining several back injuries from his violent behaviour. After a short reconciliation Arnold tried to suffocate her but she was saved by her brother. She later gained a divorce and sole custody of her daughter. Regardless of all the problems, fights, disappointments and beatings, the story has a happy ending. On 13 April 1957 Maisie married Gilbert Wallace Carlin, a widower with a little daughter, making a perfect foursome. Maisie had finally found peace and happiness and led a busy but fulfilling life, achieving much during the next 56 years. She died on 20 January 2013 in the Flinders Medical Centre. 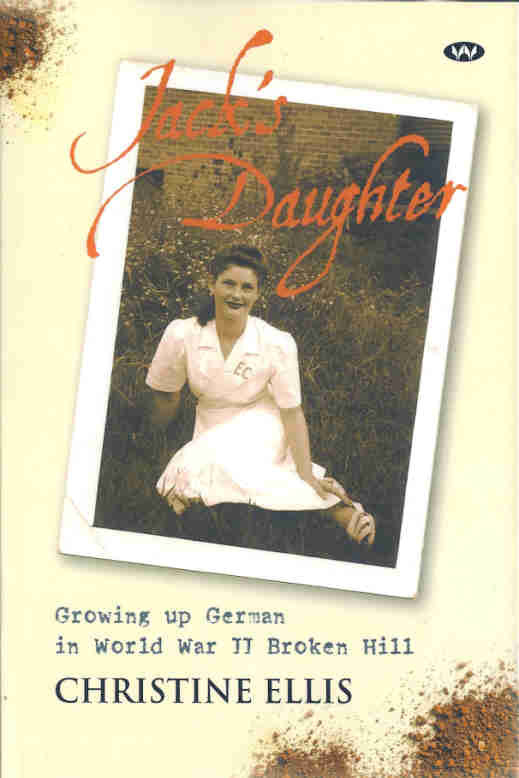 Christine Ellis, author and daughter of Maisie, should be both congratulated and thanked for giving us this sad but often wonderful story of her grandfather and her mother who, because of their German background, had a hard and difficult life in Broken Hill during, and for some years after the wars. Her mother had overcome many setbacks and even major troubles time and again with flying colours. Like her father Jack, Maisie was eventually liked, admired and much respected by the Broken Hill community. Jack's Daughter, PB 291 pp.